Visited by nearly 2 million people each year, there’s definitely no arguing that there's plenty to enjoy in Laughlin, Nevada. 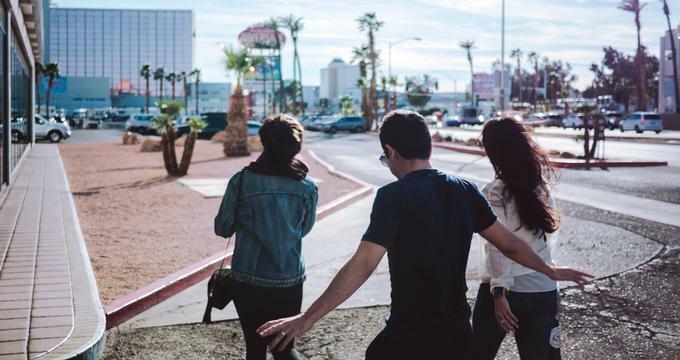 The outdoorsy folk will love all the great natural spots that Laughlin has to offer, while those who want to travel back in time will definitely get a kick out of the many sightseeing spots and tours in the city. Let’s not forget the big city entertainment spots as well as the quaint small town attractions that truly give visitors the best of all kinds of worlds. From world-class performers to unforgettable eats, it’s probably high time for you to come and find out what keeps people coming back for more on this side of the Colorado River. Leading over the Newberry Mountains of southern Nevada, the Christmas Tree Pass is a gorgeous and absolutely scenic 12-mile drive that allows visitors to see the natural beauty of the state’s desert landscape. Some views to look forward to include the Colorado River valley, sweeping vistas of the neighboring state of Arizona, and the sprawling expanse of the Mojave Desert. Adventure seekers and outdoor lovers are also welcome to find a spot to park and set off on one of the many trailheads that lead to gorgeous destinations like the Lake Mead National Recreation Area and the Native American petroglyphs. Just remember that some of the drive can get quite narrow, so make sure you’ve got a vehicle that can handle challenging terrain. A labyrinth? In the middle of Laughlin, Nevada? Yup, that’s right! 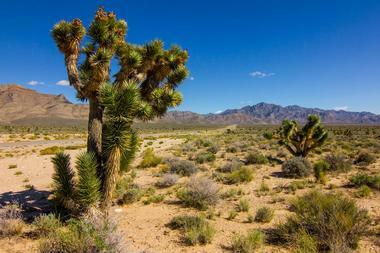 In fact, there are roughly eight of them located in the deserts of Laughlin. 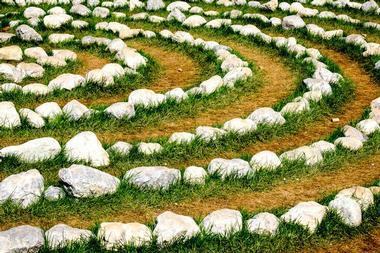 The man-made labyrinths are a great place to visit for meditation, to enjoy some peace and quiet, and to try and challenge yourself to some various mazes. Another great thing about the Laughlin Labyrinth is that it’ll actually become an interesting and scenic hike as you go from one labyrinth to another. You’ll get some gorgeous views of Laughlin’s desert terrain as well as some of its better-known landmarks and even stunning near-bird’s eye looks at the other labyrinths. Eager to discover more about the Colorado River and its surrounding area? Head straight for the Colorado River Museum, a historical land mark in its own right, to soak up all the information you could ever want. Originally built in 1947, the Colorado River Museum was intended as a means to house and serve the many people who worked on building the Davis Dam. At the museum, you can view artifacts and memorabilia that highlight the history of the area and the people who made the region what it is today. Make sure to snap photos and pick up your own memorabilia at their gift shop. Stretch your legs while exploring the best of Laughlin on foot at the Riverwalk. Well maintained and offering fantastic views of the city and the Colorado River, the Laughlin Riverwalk is a great way to get from one casino to the other while soaking up sights like Don Laughlin’s Riverside to the boats sailing by. 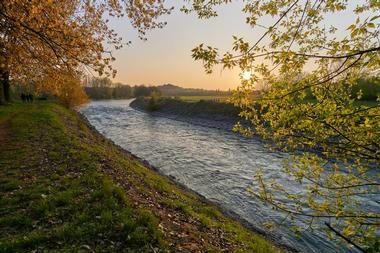 Try walking along the Riverwalk in the evening to enjoy the live bands that play on various sections of the walkway. If you’re not sure about what you want to do for the evening, taking a stroll along this stretch of pathway is a great way to see what the city has to offer on any given night as well. 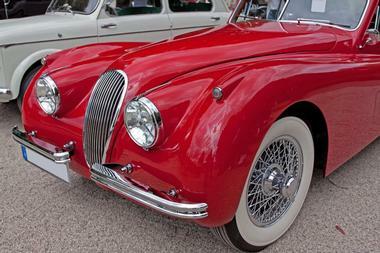 Got a thing for classic cars? Stop by Don Laughlin’s Classic Car Collection to feast your eyes on over 80 of the world’s most gorgeous, distinctive and well-kept automobiles. Featuring classic, antique, and special interest vehicles alike, all of the items displayed in this museum have been curated from private collections. Some of the vehicles in the collection are even owned by Don Laughlin himself, who is a huge fan of cars and an avid collector of them. The collection can be viewed in two separate areas of the Don Laughlin’s Riverside Resort and, best of all, are free to the public. Saddle up and pull your boots on cause there’s nothing quite as perfect as exploring the coast of the Colorado River than on the back of a beautiful horse. Pot A Gold Stables specializes in these adventurous tours, which take you trotting or galloping around the Pyramid Canyon and Davis Dam Recreation Area along the river. Guests will also be accompanied by experienced wranglers, who will make sure that you get the best experience possible and will even help you relive the Old West as you ride through the area. We’re positive that one trip is all it takes to make you gasp in awe and wonder at the dramatic vistas that Laughlin has to offer. Maximize your enjoyment of the Colorado River with some extreme water sports care of Best-Jetz Watercraft Rentals. With several locations conveniently located all over Laughlin in hotels and casinos, Best-Jetz promises top-notch services and water sports equipment rentals for all visitors. 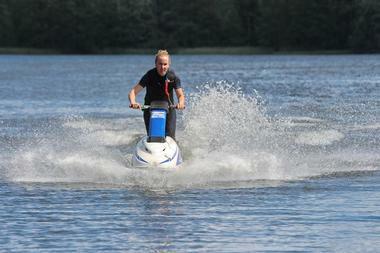 Speed around on the river water on the back of a jet ski or other water crafts for an adrenaline rush like no other. If you’re new to watersports, the friendly instructors and staff are more than willing to give you some lessons and pointers. Make sure to listen well too, because more often than not, the advice they have to give is beyond useful! 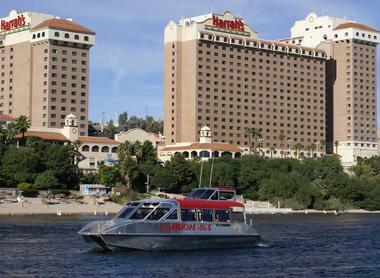 Cruise your way to an unforgettable holiday experience with the Laughlin River Tours. With the use of their deluxe 112-passenger vessel, the Celebration River Boat, Laughlin River Tours has been creating lasting memories for all of its guests, from near and far, for over two decades. Enjoy the use of a full-service bar, a snack bar, and climate-controlled rooms as you cruise serenely down the river. You can also charter special tours or enjoy a 2-hour sunset cruise while dining on a quality dinner menu prepared fresh on the boat. No matter what, you simply don’t want to miss out on all of the incredible views that a tour down the Colorado River has to offer. 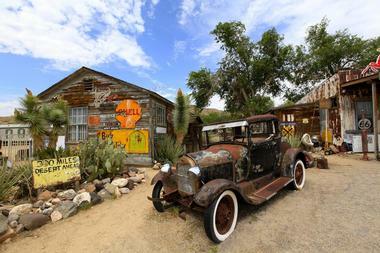 Situated across the Colorado River and up the hill from Laughlin is the small but historic town of Oatman, Arizona. Famed for being a living ghost town, Oatman was once a bustling community of over 10,000 people but has now dwindled down to a population of just over 100 people. Despite being just a whisper of what it once was, Oatman is still a fantastic place for history buffs to visit thanks to its many historical buildings. There are also fantastic photo opportunities to be had in Oatman as well as exciting shows to catch, like those of the Ghost Rider Gunfighters, who perform gunfight recreations daily. 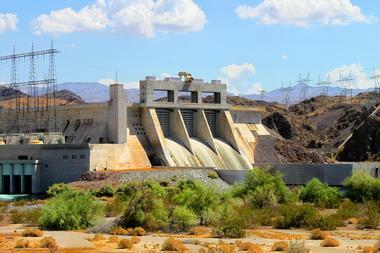 Originally known as Boulder Dam, the construction work on the Hoover Dam broke ground in 1931. It was eventually completed in 1936, and became the world’s highest damn. Now the 18th highest dam in the world, the Hoover Dam still draws visitors and tourists from near and far, all eager to gaze upon its unique build. 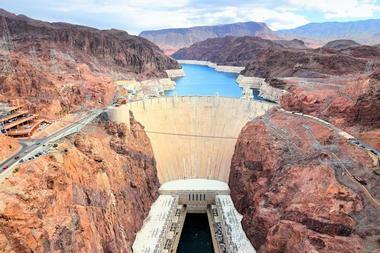 One of the best things to do at the Hoover Dam is to take a tour of its power plant. There are several tours that take you on different explorations of the plant thanks to savvy guides. There are also audio and film presentations that can be viewed here alongside informative and interesting exhibits. Did we mention that the tour gives you what could be the best view of the dam over all? Sign us up! Sitting in Pyramid Canyon and just 67 miles downstream from the Hoover Dam is the Davis Dam. Named after Arthur Powell Davis, the director of reclamation from 1914 to 1932, the Davis Dam first broke ground in 1942 and was completed in 1952. Generating up to 2 billion kilowatt-hours of energy annually, the Davis Dam is a breathtaking and powerful site to visit. 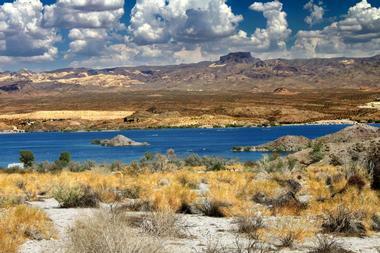 It’s also a great place to enjoy a gorgeous view of Lake Mohave, which sits right behind the dam. The vistas around the dam are equally breathtaking with the Eldorado, Black, Painted, and Pyramid Canyons surrounding the area. Get ready for something fun, exciting, and new at Laughlin Adventure Tours. Offering sightseeing tours, scenic flights, off-road excursions, and ATV tours of Laughlin, you can bet your bottom dollar that you’re going to have a high octane and adrenaline-pumping experience with this tour company. Get a bird’s eye view of the desert on one of the flight tours or, if you’re more about taking yourself through the nature of Laughlin, you can sign up for the dune buggy tours, which let you set the pace for your own sightseeing. Don’t miss out on their informative and memorable Ride Along History Tours either! A man-made reservoir created in 1951 after the Davis Dam was completed, Lake Mohave is roughly 67 miles long and straddles the southern Nevada and northwestern Arizona border. 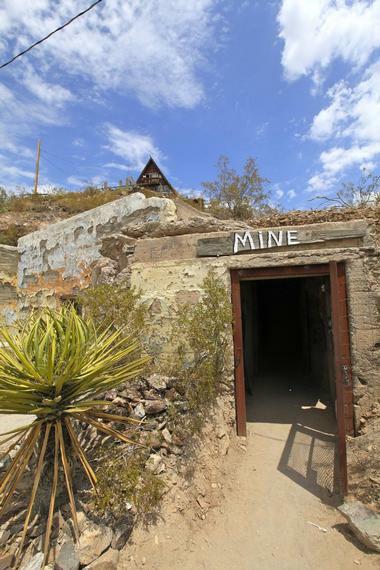 Despite being very close to Lake Mead, Lake Mohave certainly has its own unique charms and mysteries. The surrounding landscape of Lake Mohave is one of the best places in the world to hike around, with ancient Native American petroglyphs and other historical phenomena waiting to be discovered. Explore the lands that the ancient Mohave people called home on foot or take a boat around the waters to see all that it has to offer from the calm and relaxing waters of the lake. You can even go for a relaxing dip or enjoy a ride through the waters on the back of a jet ski. 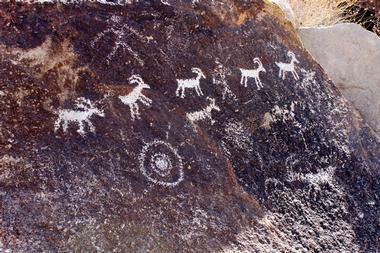 Are you ready to explore waterfalls and the 1,000-year-old petroglyphs that adorn the canyons of Nevada? The Grapevine Canyon Trail will give you a stunning experience of just that along with a great workout in Laughlin’s backyard. At 3.6 miles long and with an elevation gain of 469 feet, the Grapevine Canyon Trail is a moderately trafficked hike that will take you through a sandy and dry riverbed to start off. Once you hit the mouth of the canyon, the magnificence and historicity of the place almost immediately wash over you as you get your first look at the ancient petroglyphs. As you continue to hike up the canyon wall, you’ll be rewarded with even more spectacular views, the best of which is the remarkable sight of the Colorado River Valley. You’ll also pass up to three seasonal waterfalls before ending at natural bath tubs in which you can rest and cool off. There’s nothing quite like seeing the rugged beauty of the Colorado River up close and personal. With London Bridge Jet Boat Tours, you can do just that. As one of the oldest jet boat tour companies in Laughlin, London Bridge boasts some of the best tours in the city on the largest, fastest, and most comfortable jet boats in town. Patrons can expect to jet down 58 miles of the Colorado River, passing through the breathtaking Topock Gorge and towards Lake Havasu City’s famous London Bridge. You’ll also get to admire some of the most beautiful views that this area has to offer, like the volcanic rock faces, ancient Native American petroglyphs, and enchanting waters – all of which you’ll only be able to see from the river.